Going to where people are moving, Royal Oak Michigan! Our movers are going to where the people are moving, and Royal Oak, MI seems to be the place to move recently! Upon moving many customers from other cities in Southeast Michigan like; Livonia, Dearborn, and Ann Arbor to the city of Royal Oak, we decided to see what all the hype was about. 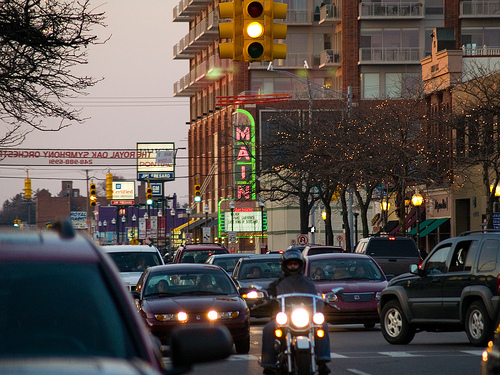 Downtown Royal Oak has more to offer than the average downtown it has over 5 miles of downtown to walk around. Over 70 restaurants like; Andiamo, Bostone Brewery and Red Fox English Pub with an outside patio and fireplaces to enjoy. Along with amazing restaurants, our movers have told us people are moving there for much more; They enjoy Royal Oak’s great meeting places like Goldfish Tea or some wide branded coffee places like Starbucks and Caribou coffee or for some frozen yogurt at Sweet Earth. There’s not much to miss in this city; Brewery’s, Clubs and Bars, Comedy Clubs, Theatres, Study spots, Parks, Pet friendly patios, stores and much more. We have been moving singles and families to this area, featuring over 85 boutiques, salons, and retail shops, the downtown never ends. Not to mention the fun concerts, festivals, and events the Downtown Royal Oak holds. When moving into the neighborhoods in the City of Royal Oak, home buyers or renters look at many other aspects the city has to offer. It is extremely pet-friendly, with 50 parks for the community to enjoy. It is conveniently located around many freeways; the population shows a very diverse mix of people, age groups, incomes and homes that attract all types of home buyers. With all these amenities people that are already living in Royal Oak don’t want to move out of it, but maybe their lease is over or they want to move closer to a downtown loft or farther for more of a neighborhood feel and bigger house to accommodate them. But all are still close enough to walk downtown. We move it all even if you’re in the city and want to move to another location in the city. We are experienced with people moving within cities or from very large cities and very small hometowns to popular downtown areas like Royal Oak. Please contact us and see how we can help you during your move to a downtown area like this!